Rembrandt van Rijn is one of the world’s most famous painters and one of the earliest masters of creating ‘virtual reality’. Meeting Rembrandt: Master of reality gives the user a unique opportunity to experience the possibilities of VR technology through Samsung Gear VR platform. What if you could have the chance to meet Rembrandt? The user can experience living a moment in time with the famous 17th century master painter and get close up and personal as he changes history forever with his controversial painting, the Night Watch. education, art&design, narrative, art history. Travel back in time and feel what life might have been like in 1642 during the Dutch Golden Age. Go inside the house of Rembrandt to get a glimpse into the life of one of the most famous painters of all time. Be a part of the movie as Rembrandt responds to your actions bringing an extra level of immersion to the experience. The rich environment you enter into is visually stunning because of the unique techniques used to heighten the quality to the highest level possible. The best thing about VR experiences is that they can take you to fantastical places — or meet people you’ll never get to meet in real life, like Dutch master Rembrandt. 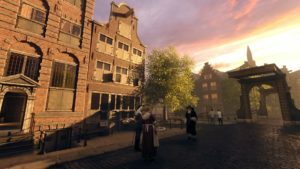 Oculus has teamed up with virtual reality studio Force Field for a Samsung Gear VR experience that takes you back to 17th century Amsterdam. 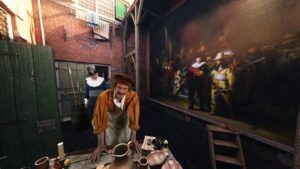 Meeting Rembrandt recreates the artist’s home and surroundings, using a live actor to play the artist against computer-generated environments. It’s quite different from the Vincent Van Gogh experience The Night Cafe, which gives you the power to jump into the world in his oil painting. The experience is available on Oculus’ Gear VR store for free. Since it was made for Samsung’s VR platform, user will need the tech titan’s headset and a compatible phone like the Galaxy S8 or Note 8 to run it. Meeting Rembrandt puts you right in the middle of the most notable events in the artist’s life instead. You can even interact with him in his atelier and see the creative process behind his most famous painting, The Night Watch. The interface is clean and intuitive and the wayfinding map is highly responsive. Created by ForceField in partnership with Rijksmuseum and Samsung Gear VR as part of Oculus VR experiences, Meeting Rembrandt transports visitors to artists lifetime in Amsterdam, to the places he lived in and where he worked, and user has also the opportunity to interact with great master and find out more interesting details about the famous Night Watch. Visitors can take a look inside Rembrandt’s house and look around the studio – examining paintings, sketches and even pose for the master – while listening to Rembrandt’s voice and following his instructions. The experience aims to capture the feeling of being in Amsterdam in the times of Golden Age set in 1642. Since the experience is designed to be accessible to everyone regardless of IT or VR expertise, there are no sensors or special controllers. User rather follows the narration of the story. It is around 7 minutes long in duration, so it is just enough for the comfortable and interesting experience, even for non-experienced VR/AR user. Its length and complexity don’t make it any less immersive though. 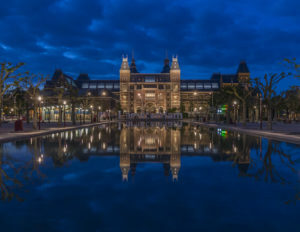 The experience itself is a tour of Rembrandt’s period in time in Amsterdam: traveling back in time to see the old canals, visit masters famous house and take a peek into the personal life of Dutch painter. Force Field chief Arthur Houtman said. Meeting Rembrandt is a free GearVR experience that allows you to discover what living in 1642 would be like. Meet one of the greatest painters of all time, Rembrandt van Rijn, as he struggles with his most famous and controversial work, the Night Watch. Not only will you be able to interact with the master himself, he will also respond to your actions as you explore the setting of the Dutch Golden Age. Using new techniques that combine high-resolution footage with computer generated backgrounds; user will be transported to one of the highlights of Dutch history, at the highest level of immersion possible on the Samsung GearVR. This project was supported by Oculus and made in collaboration with Force Field VR. The user is a part of the movie as Rembrandt responds to their actions, bringing an extra level of immersion to the experience. The rich environment users enter into is visually stunning because of the unique techniques used to heighten the quality to the highest level possible on the Samsung Gear VR. Production team used archive materials, artifacts and historical documents to model 17th century Amsterdam with great detail. It includes interactions with people of Amsterdam; the user can meet some of Rembrandt’s patrons and, of course, Meeting Rembrandt incorporates the great Master into the experience, offering users interaction and connection with the famous artist. As the main art-piece, Night Watch was recreated in great detail by 3D modelers. The main thing about the Night Watch is not the painting itself, but rather the experience the user of VR goggles gets when observing Rembrandt at work. This was done using Rijksmuseum technical research, and informed every detail, down to the layering of paint. The experience is filled with details. It starts with the view of Rembrandt’s house in Amsterdam in present days, which stops at the entrance of the Rembrandt’s Huis Museum. After that, the presentation switches to older period of time and the user can experience old buildings situated near the channels and see the house as it was in Rembrandt’s times. After this initial opening the story unfolds before us in around 7 minutes. Meeting Rembrandt wants to present the short story of creation of one of the most important paintings in the world of art, Night Watch, through immersive digital storytelling with interactive elements that allow user to have control and to adapt the storytelling according to the user’s own pace and interest. The goal is to create an overall appealing experience that would not only be interesting to younger generations but will also provide more insightful and detailed information on events, people and places in the world of cultural heritage in general. So it is not only for teenagers familiar with VR, but as a free downloadable application that can be used in Samsung Gear VR headset in the comfort of users home, gives the Rembrandt experience even more appeal and could be interesting to people who might never have tried VR before. Interaction, although limited, is still interesting enough: the user sits for Rembrandt in his studio while he is painting and follow the instructions the master is giving them. Users are sat in a chair and can glance around the Rembrandt’s studio room to look at some of his pupils at work and see 3D objects but they cannot touch things or walk around the space. Since the instructions are given directly from storytelling, users can easily follow the narrative and get intrigued by presentation itself. A voiceover (Rembrandt) explains how to trigger selected objects or areas by looking at them and prepares the setting for the next scene. With availability through Oculus Gear VR platform (https://www.oculus.com/experiences/gear-vr/) users can now download Meeting Rembrandt VR experience for free directly from Internet and enjoy the possibilities of digital storytelling from anywhere in the world. VR opens a world of possibilities by creating the sensation of being entirely transported into a virtual (or real, but digitally reproduced) three-dimensional world. VR provides a visceral and immersive experience that traditional screen-based media cannot. Meeting Rembrandt: Master of reality represents some of best practices that will help to develop VR experiences that users will enjoy and that will bring cultural heritage and digital technologies closer together through immersive experiences such as Meeting Rembrandt certainly represents. Content goes here Force Field (formerly Vanguard Games) is an independent studio founded in 2015. It has since developed high-end content for different VR headsets like HTC Vive, Oculus Rift, PlayStation VR and mobile VR. By working closely with leading hardware manufacturers at an early stage in the life-cycle of VR, Force Field established itself as an experienced studio that can get the most out of new hardware innovations. This already resulted in several major VR projects. Many more titles are in development; so we can expect to hear more announcements on these projects becoming a reality very soon. As of 2017 Force Field has ventured out into the market for of out-of-home / location based VR and AR entertainment. They deliver mind-blowing VR experiences to family entertainment centers, theme parks and VR Arcades. Oculus powers the Samsung Gear VR, the most widely distributed VR headset in the world. Supported by Samsung’s global distribution and marketing efforts, Gear VR is compatible with the tens of millions of Samsung GALAXY flagship smartphones, including Note 8, S8+, S8, S7, S7 edge, S6, S6 edge, S6 edge +, and Note 5. The general user experience is focused on the basic interaction between user and the VR environment. The great feature is that the users can define their own session duration. VR requires a unique physicality that is absent in other display technologies, as users are wearing a device on their head and are often standing and/or moving their bodies. Developers at Meeting Rembrandt took this into consideration and are mindful of the user’s need to take breaks from engaging with the content. Users therefore have the freedom to suspend their experience, then return to the exact point where they left off at their leisure. Well-timed suggestions to take a break, such as at save points or breaks in the action, are also a good reminder for users who might otherwise lose track of time. Incorporating resting positions into the VR experience helps minimizing the fatigue users may feel during extended VR sessions. The more time users accumulate in VR, the less likely they are to experience discomfort. the comfort of their homes, letting them drop into worlds they can only dream of visiting.But aside from teleportation, VR can also be a time machine, taking you back into the past to experience key moments with historic figures—like hanging with master painter Rembrandt. “One of the cool things about VR is that we can bring history to life in a very immersive way.” says Arthur Houtman, CEO of Force Field. Actual experience is as if user is actually there, upclose with Rembrandt, in his atelier, in his house, as he interacts with the user and lets them understand why his work was so controversial in that day and age. Meeting Rembrandt: Master of Reality is much different from the VR artist experiences as for instance Dali , Bosch, and Bruegel. This Rembrandt Gear VR app lets you meet the artist instead of jumping into the painting themselves. The experience is free and can be downloaded from the Oculus Gear VR store. Oculus Studios has teamed up with VR studio Force Field to bring users a Gear VR experience that lets one travel back in time to meet one of the world’s most iconic artists. Now available to download for free, user will find himself in 17th century Amsterdam immersed in the stunning scenic home environment of the Dutch master painter. The experience places you right in the middle of key events in the life of Rembrandt, including the creation of one of the most valuable paintings of all time: The Night Watch. Production team developed an experience that shows how lifelike VR can look on a mobile device. By merging live actors with computer generated environments, the studio created an intriguing new spin on a historical artist experience. The experience stars Dutch TV and theatre actor, Reinout Bussemaker as Rembrandt and Derek de Lint, (Poltergeist the Legacy) as Jakob, one of the militia men portrayed in Rembrandt’s famous The Night Watch painting. The experience combines CGI environments with live actors to create historical journey. The user finds themselves in 17th Century Amsterdam, home of iconic Dutch painter, as witness to key points in the life of the painter, including the creation of one of the most valuable paintings of all time ‘The Night Watch’. The design and interactive user experience combined with the high quality technical solutions make Meeting Rembrandt: Master of Reality a best practice case and represent the future possibilities for presentation of cultural heritage of historical events or figures. A collaborative creation between Oculus, Force Field programmers and Rijksmuseum team, Meeting Rembrandt VR combines the latest VR technology, innovative design and user experience solutions combined with interactive storytelling. Meeting Rembrandt is also quite different in the fact that developers put a real life actor in the digital space. The developers were able to recreate Rembrandt’s home in Amsterdam and add in a person to match certain settings that is quite brilliant. In addition, the Meeting Rembrandt allows you to be a part of the movie where he responds to your actions which makes the experience that much more immersive. This new VR title is available on Samsung Gear VR at the Oculus Store. The best thing about this is that it’s free. It’s a great example of digital storytelling experience combined with historical and cultural contents. It shows the range of usage of VR that can be used by any gallery to enhance the already existing storytelling in museums on simple, efficient and adaptive way. 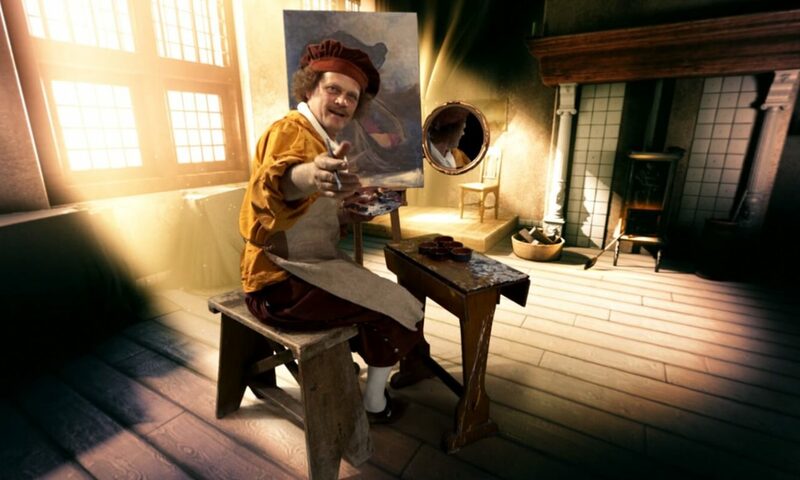 For now Meeting Rembrandt: Master of Reality is only available for Oculus Gear VR platform.